This slightly carbonated and murky mixture can be daunting at first sight: tipping the bottle upside down unleashes a cloudy and blob-like mess of sediment that swirls upward—reminiscent of a science project. No, it’s not a pretty drink, but when you look beyond its murkiness, the health benefits far outweigh any fear of taking a swig. Essentially, it’s like taking a probiotic in “food form” instead of a capsule. The benefits of this great gut elixir help to repopulate the good or friendly bacteria (the gut microbiome) that are necessary for a healthy and balanced gut to thrive. And, this is pretty important since roughly 80% of your immune system is located in the gut: it’s literally the epicentre of your body. It’s called the “gut,” but the bacteria actually thrive in your small intestine (SI). The stomach prepares the food for digestion and then moves it along into the small intestine, where the majority of nutrients are absorbed. These bacteria are necessary for absorption, elimination and immune function—all working in perfect balance. When the SI lacks a healthy population of good bacteria, one of the most common signs creeps up: gas and bloating due to poor digestion and absorption of nutrients. This begs the question: how many nutrients are actually being absorbed by your body? An unbalanced SI can lead to a weaker immune system, headaches, muscle and joint inflammation, loss of concentration, brain fog and the list goes on. And it’s easy to derail this balance: culprits include a round of antibiotics, chronic stress, consuming too many refined and processed foods and over-consumption of sugar, alcohol and yeast-containing foods like bread. But it’s also easy to restore the good bacteria by adding fermented foods to your daily diet, and kombucha is brimming with it. In fact, all unpasteurized fermented foods are chock-full; however, they must be “unpasteurized” in order to preserve the live bacteria—keeping it active. Kombucha has been enjoyed for centuries. 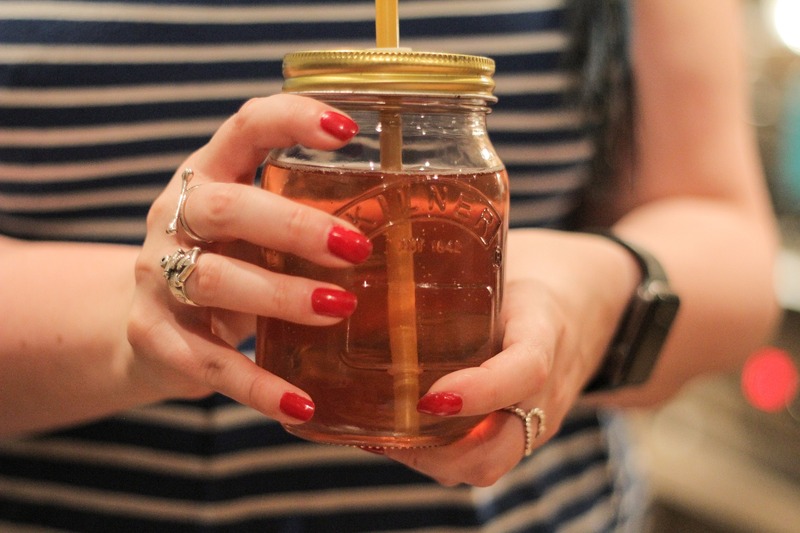 It’s made from four basic ingredients: tea, sugar, water and a bacteria starter known as the “SCOBY (Symbiotic Culture Of Bacteria and Yeast),” which are fermented in a two-stage process. As it ferments, the tea can be flavored with citrus, ginger, berries, beets or any combination and voila, you have a freshly brewed batch. Well, not exactly—there’s an art to brewing kombucha, but you get the idea. Adding a few sips to your daily diet is an excellent way to keep your gut bacteria in-check. Given the blend of teas used—a mixture of green, black and sometimes white—it contains caffeine so don’t be surprised if your energy levels perk-up. It’s a great alternative to coffee, but if you’re caffeine-sensitive, start out with a small cup and consume before mid afternoon, giving your body time to process the caffeine before going to bed. Watch the sugar content as it can be high in some commercially brewed kombuchas. Likewise, if you have Candida (an overgrowth of yeast in the SI) then it’s best to hold-off until your gut bacteria have been rebalanced –the sugar and yeast will only fuel an existing overgrowth. Kombucha can be found in most health food stores, as well as some grocery stores. Check the cooler section as it needs to be refrigerated. You can also try brewing a batch, but you need the Scoby culture starter—for fermentation—and this can be tricky to locate. Whether you buy it or brew it, get kombucha into your gut. You may be surprised by how easy it is to help rebalance your SI and reclaim what’s rightfully yours. Bottoms up. To your health! Mary Savage is a Certified Holistic Nutritional Practitioner. She is a Wellbeing Counselor for a national grocery store chain, a nutritional consultant, journalist and life-long learner. She was diagnosed with an Auto Immune disorder in 2006 – prompting her to study nutrition. You can find Mary on LinkedIn.